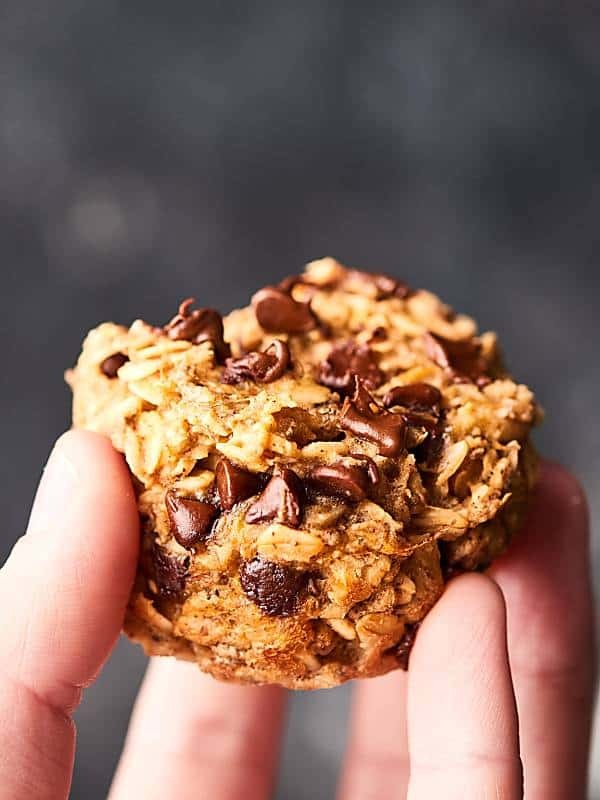 These Healthy Baked Oatmeal Cups are naturally sweetened with bananas and are loaded with oats, all natural peanut butter, almond milk, and a handful of dark chocolate chips! Vegan. Gluten Free. 130 calories! It’s been an easy drive so far . . . not too much traffic and we’ve had amazing weather. We drove about 12 hours yesterday and have 8 left until we hit our final destination. As you know, the most important thing to make a road trip successful is . . . road trip SNACKS. If only I would’ve had these Healthy Oatmeal Cups on hand! While we didn’t have these Healthy Oatmeal Cups, we WERE fully stocked with other yummy deliciousness: hummus, cheese sticks (hello. we’re from Wisconsin), energy bites, and more. 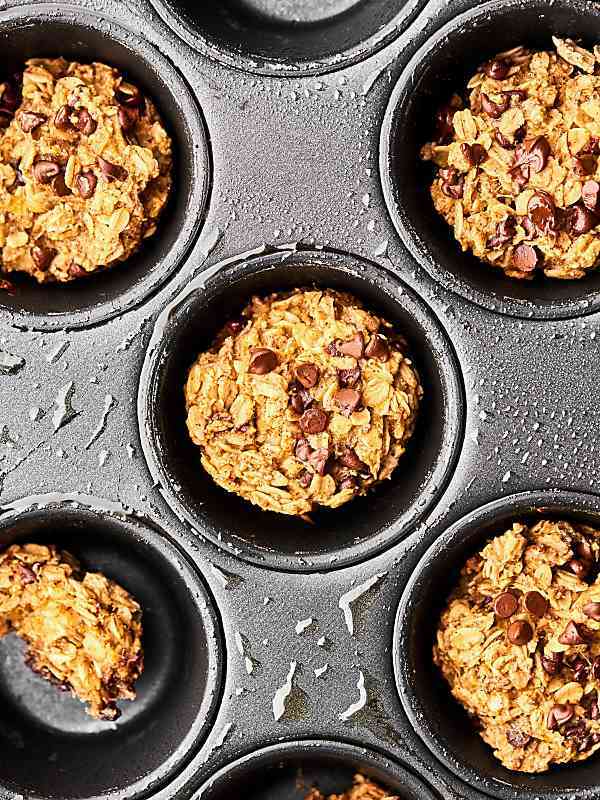 Which – btw – coffee goes PERFECTLY with these Healthy Oatmeal Cups. Once we’re actually IN Salt Lake City, I plan on making a batch – or two – for our time there. Whisk a bunch of things together —> bake in muffin tin—> top with fave toppings —> devour —> devour more —> repeat. The bunch of things include: mashed bananas, all natural nut butter (no sugar added, just the roasted nut variety), almond milk, a chia egg (chia seeds + water <— whisk and sit = chia “egg”), old fashioned oats, cinnamon, baking powder, salt, and some dark chocolate chips. Once the above is whisked, you’ll bake ‘em for about 15 minutes, then top them with whatever you’d like. 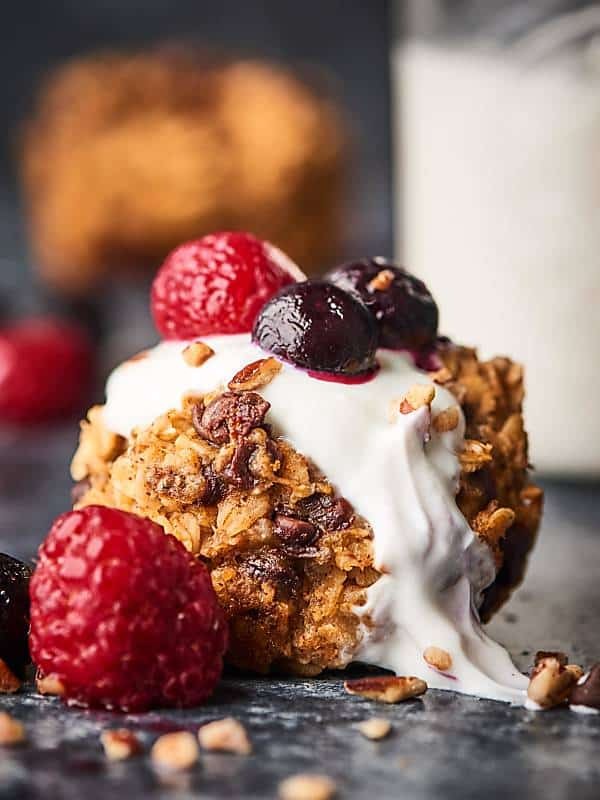 I HIGHLY recommend some non fat plain greek yogurt (or your favorite vegan yogurt, if you’re vegan), a drizzle of pure maple syrup (because, um, there’s no added sugar in the muffins! so a little maple syrup is just heavenly), and some fresh berries. Easy. Healthy. Vegan. Gluten Free. Perfect for on the go, make ahead, delicious breakfasts, snacks, and dare I say desserts? Do you want more healthy, make ahead breakfast recipes? Show Me the Yummy! In a large bowl, mix together chia seeds and water. Preheat oven to 350 degrees F and spray a standard non stick 12 cup muffin tin with cooking spray. To the "chia egg" (see above), stir in banana, peanut butter, almond milk, oats, cinnamon, baking powder, salt, and chocolate. Use a 1/4 cup measuring cup to scoop the batter into a prepared pan (you'll only fill 9 slots). Remove from oven and top with non fat plain greek yogurt, fruit, maple syrup, etc! Store leftovers at room temperature or in the fridge in a sealed container! Oh my! They look amazing! They would make fabulous road trip snacks! Thanks for this recipe Jen & Trevor. They’re so good. My family enjoyed them also. Yay!! So happy you’re family loved these, Lee! These look yummy! I, of course, will have to try them (probably several times) before our next road trip! P.S. We make the trip from Topeka, KS to Salt Lake City every year so when your post said you were in the ‘middle of nowhere’, I could picture it! OH MY GOSH!!! These look just incredible. Love the berries baked inside. YUM! Yummy! These look so delicious!! I’m sure they make an awesome snack. 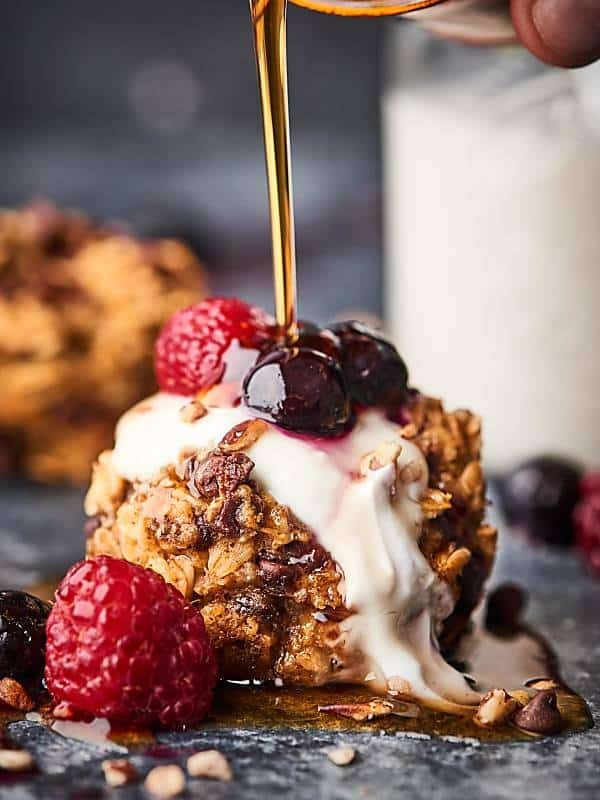 🙂 I think I’ll have to give these a try soon…I LOVE baking with oats. Thanks for the recipe! Do you have the nutritional info on these muffins? Interested in carbs and fibre. Thanks. Hi Wendy! Carbs: 15.8, Fiber 2.2 🙂 I hope that helps! How about substituting the chia “egg” with a real egg? Yes, that is what I would do. I love eggs! Looking forward to seeing how my partner and his daughter enjoy them. Such a delicious breakfast or dessert idea, Trevor and Jennifer! A healthy dish is always welcomed in my diet! I made these for the holiday weekend and they turned out great! Quick, easy, delicious and portable too! Thanks for a great new go-to recipe. What are the carbs and sugar content? Should they be soft or crunchy? 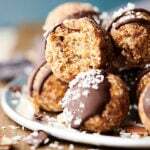 Oh my gosh – just made these this weekend for my mid morning snack during the workday and they are amazing! 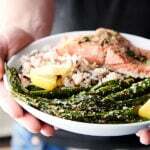 I’m not even hungry for lunch – thanks for sharing this awesome recipe! This is going to be a go to for me and I can’t wait to make some for my kids! 🙂 Super easy and sooo delicious! Hi! Can you substitute pb2 powder peanut butter for the regular peanut butter? If you mix the pb2 powder with water (per the instructions on the jar, I believe) and use equal amounts for the peanut butter, it SHOULD be fine, but since I haven’t tried it, I can’t guarantee the results. Hope that helps! I sub PB2 every time and have never added any extra liquid…just dump the powder in as is. They always turn out great! I double the recipe and bake in a pan. Good to know! Thanks Roxanna! Love these! So easy and a great snack. Hi Alia! 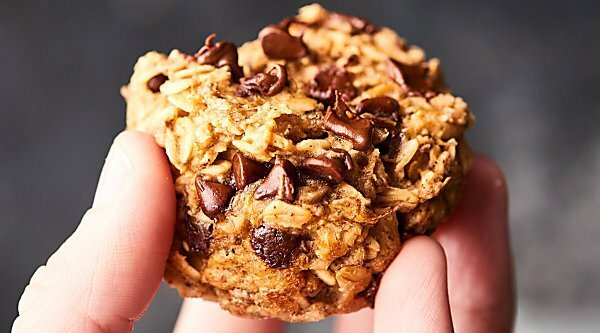 I have not tried this with oat flour… I would imagine you’d need to do some tweaking to the recipe if you’d replace with the flour since the consistency is so different. Hi I find myself out of bananas quite ab it and especially when I want to make these yummy recipes. 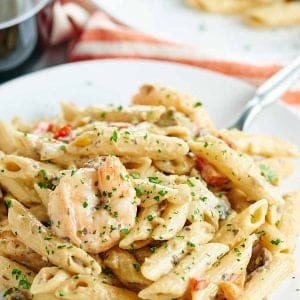 Are there any substitutions for bananas or can this recipe work without them? You could try canned pumpkin or applesauce in this recipe! They were delicious with no eggs going to make them again. Tasted good with out the egg and chocolate. All it need was the oatmeal, banana, peanut butter. can I use quick oats instead of old fashion? How about substituting the chia seeds for ground chia seed? I only have that. If I can use it, need add the water?